In 1957 the world’s first autologous stem cell transplant was performed by Dr. E. Donnall Thomas. Just over ten years later, in 1968, a successful bone marrow transplant took place between siblings, it was a world first but it wasn’t until 1973 that the first successful transplant took place between two people who were not related. It would take another 15 years before the world’s first successful umbilical cord blood transplant would take place. It was performed in 1988, in Paris. Five years later two successful cord blood transplants between unrelated people performed by Dr. Joanne Kurtzberg. 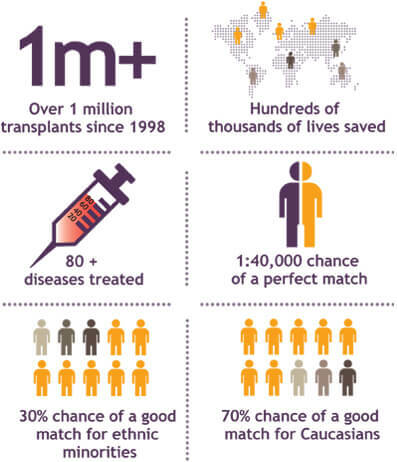 Since 1998 over one million transplants have taken place. Since the very first stem cell transplant in 1957, hundreds of thousands of lives have been saved. Thanks to not only developments in science and transplant medicine but also to the creation of registries, donors joining the registries and awareness campaigns. However, there is a huge shortage and donors are still needed to help meet the demands of those in need. Currently, there are over 80 illnesses which can be treated with cord blood. These include blood cancers and disorders such as leukaemia, lymphoma, myeloma, sickle cell anaemia, aplastic anaemia and fanconi anaemia. Cord blood can be used to treat metabolic disorders such as krabbe disease and hurler syndrome as well as solid tumours like neuroblastoma. With thousands of clinical trials investigating the potential of stem cells, this list is likely to grow. For those who need a stem cell match doctors will first look to see if a match can be found within the family. Only 30% of patients will find a match within their family, the other 70% will have to turn to the public register. The odds of finding a match on the public register can be as low as 1:40,000. The only way to beat these odds is to bank your baby’s cord blood. Banking your cord blood with a family bank guarantees a perfect match for your baby while banking your baby’s cord blood in a community bank increases the odds of a family in need finding a match for their loved one. Ethnic minorities are under-represented on stem cell registers in fact ethnic minorities only have a 30% chance of finding a match. For families who have a complex racial makeup, such as mixed race families, the value of banking your baby’s cord blood cannot be underestimated. People of mixed race particularly struggle to find a stem cell match and banking cord blood of babies of mixed race will be a welcome addition to public registries or eliminate the pressure of finding a match for the baby should the cord blood be banked in a family bank and needed in the future. In contrast to those of ethnic heritage, Caucasian people have a 70% chance of finding a good match from a public register. However, we can vastly increase the chances of those in need finding a stem cell match by increasing the amount of cord blood banked. 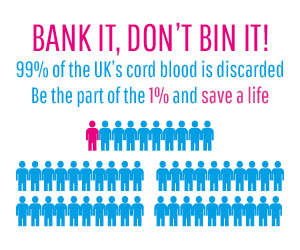 In the UK last year there were over 800,000 births yet the UK banked less than 1% of the cord blood available, that’s less than 8,000 births. If we banked 50,000 cord blood units then over 80% of transplant requests would be met.